Summary: 99.9% of all dogs can be house trained and yet there are hundreds of thousands abandoned by people who claim their dog couldn’t be trained. They just haven’t tried hard enough potty training a puppy or have not had the patience to do it right. We give you 3 ideas to try potty training a puppy in this popular article. If you are looking to have a good companion, you definitely will need to make certain your puppy is completely house trained. You cannot expect a puppy to just train itself and do it over night. Until a puppy is trained to go where you want them to go, they will just go whenever and wherever the urge comes. They are not programmed to know if they are standing on that rare piece of luxurious carpet. Crate training teaches the puppy to eliminate outside, whereas paper training is usually considered an intermediate step. Crate training is fairly simple. A crate becomes your puppy’s personal den. Dogs instinctively will not want to soil their den. Unless you leave your puppy in the crate too long, he or she will not have an accident in the “crate”. You need to take your puppy outside frequently to the same spot for him to eliminate. Taking the puppy to the same spot each time will reinforce its desire to potty since it can smell what happened there last time. Some even use the words like potty or hurry up or it’s time while their puppy is doing his or her business. They do that so when the puppy is in an unfamiliar place it will know what is expected when he or she hears those same words. By using crate training your puppy will learn to control its urge to go until he or she is outside. Puppies need to eliminate often, so take them out quite often at first. 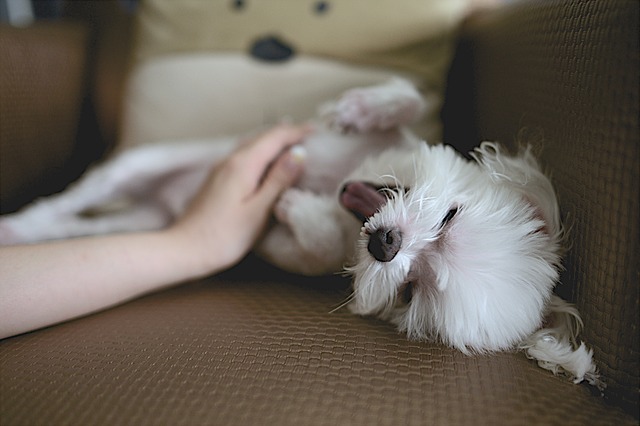 Gradually, your dog will be able to wait for longer periods of time. Once your puppy is totally housebroken you can leave the crate door open during the day. Your puppy will probably choose to use the crate for naps and quiet time alone. Paper or pad training is training the puppy to eliminate on a pad or on newspaper. You need a small room or part of a room in which you will cover the floor with newspapers. The puppy will need to be confined to that space. When your dog soils on the paper, pick it up and dispose of most of it leaving a small part (1/3) of the paper that is soiled on top of a clean paper. The puppy will instinctively go back to that spot where it smells its urine and do it again. Keep up that process. You can use a potty pad that is especially made for puppies. The puppy pads come with a non-skid tray to put them in. You either spray a product or sprinkle a product especially made to help your puppy want to go on the pad. There are many different products on the market to help assist in potty training a puppy. Litter box training is great for those who live in condos, high rise apartments, or who have physical problems that make it hard to get out often. Litter box training works best for those who have a small dog. Litter box training is simply – You train your puppy to use a dog litter box. You can purchase or make a dog litter training box and fill it with dog litter. The dog litter will contain smells that makes a dog want to use the litter box. Set up the litter box in a convenient place; introduce your puppy to the litter box. Try to catch him or her the first few times he or she needs to go and place them in the box. When your puppy inevitably makes a mistake on your floor, don’t worry, there are products to help you clean it up. There are many great products that help in odor control and many other wonderful products that help in removing stains. We’ll discuss these in a future article. If you have further comments or questions about ‘Potty Training a Puppy’, feel free to visit our Forums or make a comment on this article below. We encourage participation and feedback.